South-east Asia's leaders are calling for the "non-militarisation" of the South China Sea to ease tensions arising from territorial disputes in this strategic waterway. A statement released yesterday by Philippine President Rodrigo Duterte as Asean chair "emphasised the importance of non-militarisation". The leaders "reaffirmed the importance of maintaining and promoting peace, security, stability, maritime safety and security, rules-based order and freedom of navigation in and overflight above the South China Sea", the statement added. China claims almost the entire South China Sea, through which about US$5 trillion (S$6.8 trillion) worth of goods pass every year. Brunei, Malaysia, the Philippines, Taiwan and Vietnam also have conflicting claims there. China has asserted its claims with a massive island-building programme in the Spratly Islands in the southern half of the South China Sea. It has fortified four of the six islands it occupies with airstrips, hangars and shelters. It already has Chengdu J-10 multirole fighters, YJ-62 anti-ship cruise missiles and HQ-9 surface-to-air missiles stationed on Woody Island in the Paracel chain of islands near Vietnam. Those arms, they are not there for any other purpose. They are not decorations. They are there because China would need them. For what purpose? I really don't know. MR RODRIGO DUTERTE, President of the Philippines and Asean chair, on China's military presence in the South China Sea. The Asia Maritime Transparency Initiative said these weapons, once deployed to the Spratlys, will be able to reach Palawan province in western Philippines and even metropolitan Manila. 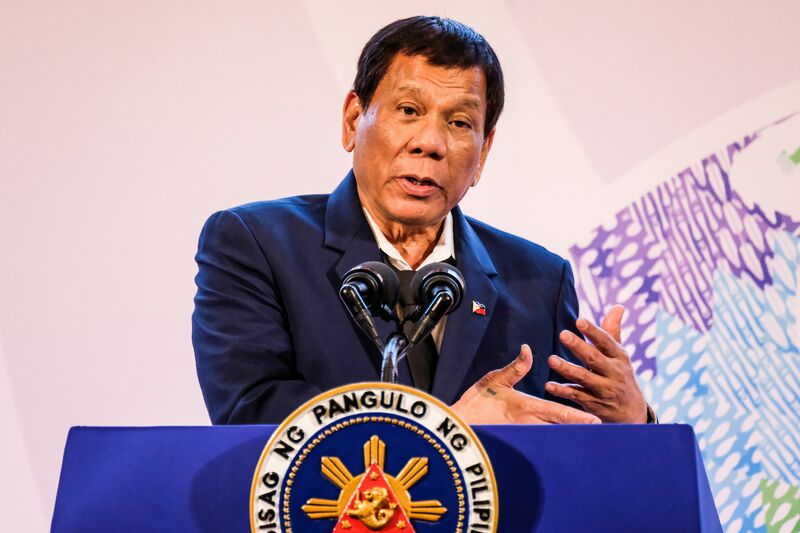 Mr Duterte said last week the weapons build-up, not just by China but also the other claimants, raises the risk of a violent confrontation in the South China Sea. "Those arms, they are not there for any other purpose. They are not decorations. They are there because China would need them. For what purpose? I really don't know," he had said at a news briefing on the sidelines of the Apec meetings in Vietnam last week. But he also said later that China's island-building would be "better left untouched", as Asean moves to conclude talks on a "code of conduct" (COC) meant to prevent disputes over the South China Sea from escalating into armed conflicts. Leaders of the 10-member nation Asean and China on Monday announced they would start negotiations on the COC and talks are set to begin next year. In a news conference after the end of the Asean summit in Manila this week, Mr Duterte said China has promised cooperation to fast-track the negotiations on the COC. He said he pressed Chinese officials to provide a date and he was told that the Chinese side would "really fast-track" it. Finalising the COC has acquired urgency following a series of skirmishes between China and its smaller South-east Asian neighbours with competing claims. In place of a legally binding code, China and Asean settled for a mere declaration in 2002 that calls on claimants to exercise restraint and stop new occupation in the South China Sea. However, its non-binding nature and the lack of provision to sanction misbehaving claimants render the accord useless against aggression.